We will have breezy conditions tonight, with strong storms arriving by early morning. 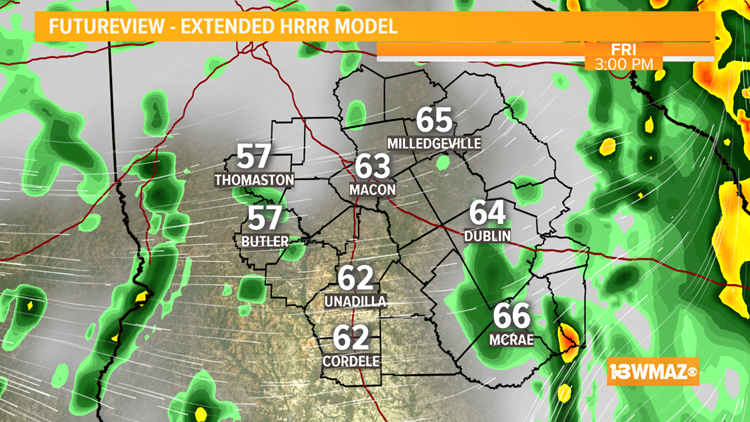 Look for storms to arrive by around 5 or 6 AM in counties west of Macon. For Macon itself, probably around 8 - 10 AM. Ahead of the severe storm threat for Friday morning, the SPC has placed all of Central Georgia in at least the level 2 of 5 threat for severe storms. The updated outlook has now placed areas to the southeast of Macon in the 'enhanced' level 3 of 5 threat. 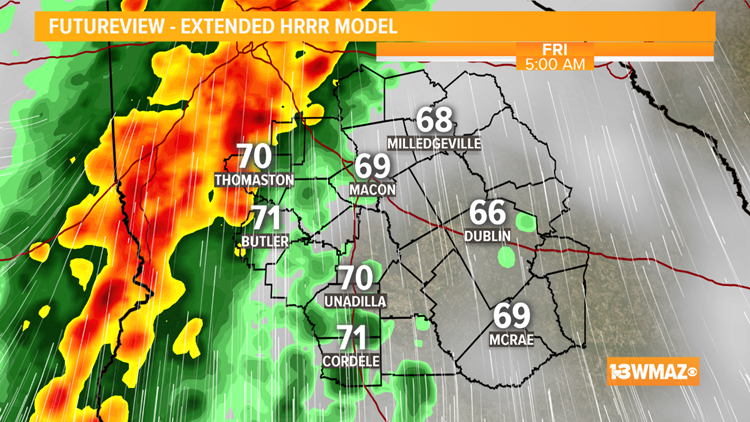 As early as 5 a.m. Friday morning a line of strong to severe storms will be knocking on the door for our western counties. This line will gradually push eastward as we progress through the morning. 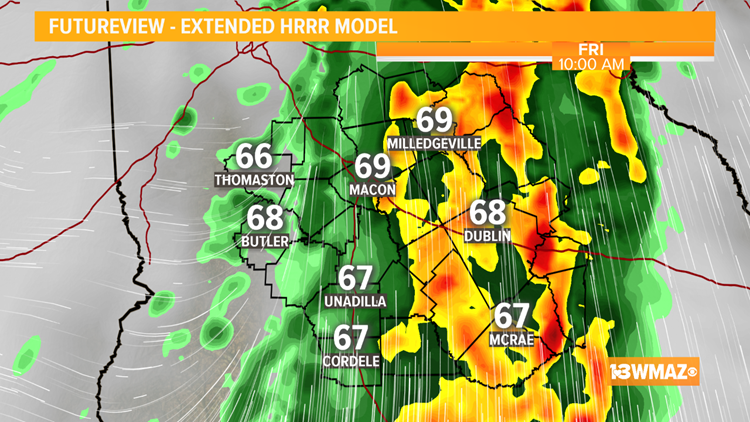 By 8 or 9 a.m. the latest models are continuing to show a line of strong to severe storms moving in to places like Macon and Warner Robins. Keep in mind that you need to be paying close attention to the weather before you drive to work Friday morning. 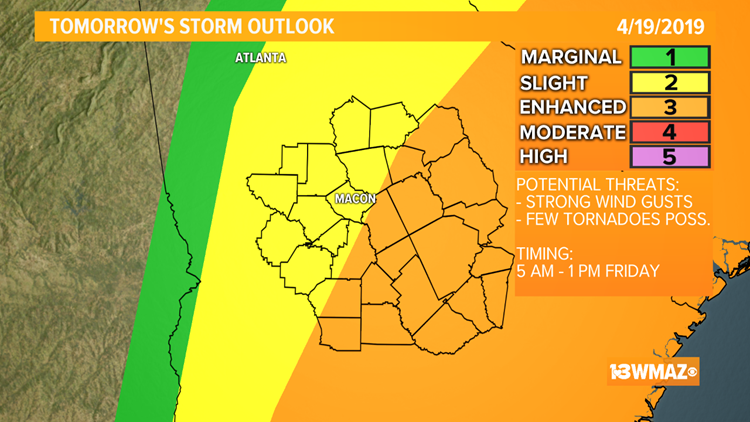 After sunrise, storms may intensify a bit as they move to the east of Macon into the enhanced risk area. By 12 or 1 p.m. the greatest strong storm chance likely comes to an end, but some showers are possible even into the late day. The main threat for Friday morning will be strong straight line wind gusts. However, embedded within the line of storms a few brief tornadoes cannot be ruled out. All storms tomorrow will be capable of torrential rain and lightning. Some hail cannot be ruled out. Tonight... Mostly cloudy and breezy. Storms by early morning. Lows in the mid 60s. Friday... Partly cloudy. Rain and storms likely in the morning. Some strong. Highs 65 - 70..
Saturday... Partly sunny. Small sprinkle chance. Highs around 60. Saturday Night... Partly cloudy. Lows in the low to mid 40s. Sunday (Easter)... Mostly Sunny. Highs in the mid 70s. Sunday Night... Clear. Lows around 50. Monday... Mostly Sunny. Highs near 80. Monday Night... Clear. Lows in the low to mid 50s. Tuesday... Mostly Sunny. Highs near 80. Tuesday Night... Clear. Lows in the mid to upper 50s. Wednesday... Mostly Sunny. Highs in the low 80s. Thursday... Mostly cloudy. Rain possible. Highs around 80.